The Council of Vienne was the fifteenth Ecumenical Council of the Roman Catholic Church that met between 1311 and 1312 in Vienne. Its principal act was to withdraw papal support for the Knights Templar on the instigation of Philip IV of France. The Knights Templar were founded after the First Crusade of 1096 to ensure the safety of European pilgrims to Jerusalem. In the following centuries the order grew in power and wealth. In the early 14th century, Philip IV of France needed money urgently to continue his war with England and so he accused the Grand Master of the Templars, Jacques De Molay, of corruption and heresy. In 1307 Philip had many French Templars arrested, charged with heresies, and tortured by the French authorities until they allegedly confessed. This action released Philip from his obligation to repay loans from the Templars and allowed him to confiscate the Templar's assets in France. Pope Clement V was under the control of Philip. One of the Pope's predecessors, Boniface VIII, had claimed supremacy over Philip and had attempted to excommunicate him when Philip disagreed. However Boniface was seized at Anagni by a party of horsemen under the command of Philip's men. Though he was later released, the elderly Boniface died shortly after. Boniface's successor, Pope Benedict XI, lasted less than a year before he too died, possibly poisoned by Philip's agent Guillaume de Nogaret. The Frenchman Pope Clement thereafter was strongly pressured to follow Philip's directions. Pope Clement V caused the council to meet by issuing the bulls Faciens misericordiam and Regnans in coelis in August 1308. The city chosen was Vienne which is on the Rhône River in Southern France (not Vienna, Austria) and at the time was outside the direct control of Philip IV. The neutral setting was intended to give the impression of independent action. The main item on agenda of council not only cited the Order of Knights Templar itself, but also "its lands", which indicated that further seizures of property were proposed. However the agenda also invited archbishops and prelates to bring proposals for improvements in the life of the Church. Special notice were sent to the Templars directing them to send suitable defensores (defenders) to the council. 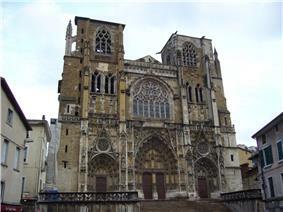 The Grand Master Jacques de Molay and others had also been commanded to appear in person. However Molay was already imprisoned in Paris and trials of other Templars were already in progress. This delayed the opening of the council which finally convened in 16 October 1311. The attendees consisted of twenty cardinals, four patriarchs, about one hundred archbishops and bishops, plus several abbots and priors. The acts of the Council have disappeared, with the exceptions of a fragment in a manuscript in the National Library in Paris, and of the financial documents of the Templars that were requisitioned. The work of the Council was not done in plenary session, but a commission was appointed to examine these official records concerning the order, with a smaller committee of archbishops and bishops presided over by the Archbishop of Aquileia, which was to examine exhaustively the official records and the abstracts. 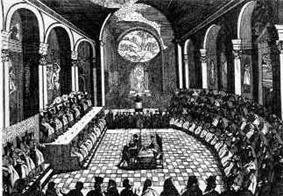 The pope and the cardinals negotiated with the members of this commission respecting the matter. A commission of cardinals was also appointed in order to investigate grievances and proposals advanced on the subject of church reform. A majority of the cardinals and nearly all the members of the commission were of the opinion that the Order of Knights Templar should be granted the right to defend itself, and that no proof collected up to then was sufficient to condemn the order of the heresy of which it was accused by Philip's ministry, without straining Canon law. The discussion of Knights Templar was then put in abeyance. The topic changed to the need for an expedition to the Holy Land and about the reform of ecclesiastical morals. The delegates of the King of Aragon wanted the city of Granada to be attacked to attack the Muslims on the flank; others wanted a crusade to the east only. This bull was approved by the Council on 3 April 1312 and the Pope announced a future crusade. The bulls, Ad providam of 2 May and Nuper in concilio of 16 May confiscated Templar property. The fate of the Templars themselves was decided by the bull Considerantes of 6 May. In the bulls Licet dudum (18 Dec. 1312), Dudum in generali concilio (31 Dec. 1312) and Licet pridem (13 Jan. 1313) Clement V dealt with further aspects of the Templars' property. In return Philip IV dropped the threatened charges of heresy against the late Pope Boniface VIII. Nevertheless, an earlier decree was renewed, whereby the King of France was absolved from all responsibility for whatever he had done against Boniface, though the notorious "Outrage" at Anagni was never actually mentioned. At the third and final formal session, held May 6, a letter from the King of France was read aloud, in which he promised to take up the cross, together with his sons and large numbers of the nobility, and to begin the Crusade within six years. If he should die before this time, his eldest son would undertake the expedition. The usual reaction to such a declaration was to lay a church tithe: the tax was levied throughout Christendom for six years for this purpose, but in France the revenues drawn from the six years of tithe were held by the king, who in fact used the funds to wage war against the Christians of Flanders. The Crusade never took place. The written suggestions for discussion by the council as to the reform of the Church, did not aim to improve of morals, but instead tried to specify what constituted "poverty" for the clergy and to protect the Church's independence of action (an urgent question, in the circumstances). These matters were also dealt with in the third session of the Council by the approval of an unknown number of draft constitutions. These were revised and further constitutions were added after the Council had ended, but they were not finalised until after Pope Clement's death in 1314. They were published in 1317 by Clement's successor John XXII as the collection of canon law called the "Constitutiones Clementinae". Giovanni Villani discussed the Council of Vienne in his Chronicles, IX, XXII. In 1311, The Council ordered the disbandment of The Beguine Movement. The beguiled were a group of women all over Northern Europe, eventually spreading to the Low Countries (France and Germany). They were persecuted and eventually deemed as heretics and disbanded. According to the Council, members of this movement were deemed heretics because of their stance taken concerning the perfectability of the human person in this life, and the. privileges accorded to such persons permanently and absolutely perfected (such as remaining seated before the consecrated Eucharist). The council also decreed the establishment of chairs (professorships) of Greek, Hebrew, Aramaic and Arabic at the Universities of Avignon, Paris, Oxford, Bologna and Salamanca, although the chairs of Arabic were not actually set up.